Soak up the atmosphere at one of Norway’s many Christmas markets and fairs and find tastes and gifts you won’t get anywhere else. This means that the traditional Norwegian Christmas fairs are returning for another season of unique Christmas gifts, exciting artisan foods, and cosily lit winter streets. In the weeks leading up to Christmas Eve, there are plenty of fairs popping up all around the country. Here are ten of the best Norwegian Christmas markets in 2018. This means that the traditional Norwegian Christmas fairs are returning for another season of unique Christmas gifts, exciting artisan foods, and cozily lit winter streets. One of the capital’s Christmas fairs lasts for well over a month by Spikersuppa on the main street Karl Johans gate, a mere stone’s throw away from the Royal Palace. Winter Wonderland combines delicious food and delicacies, high-quality craft, a Ferris wheel, and lots of additional fun for the whole family. During the winter season, Spikersuppa is Norway’s most popular public ice skating rink. Entrance is free, so bring your skates and practice your pirouettes. Since the idea was conceived around a small kitchen table in 1999, the designers’ market in Oslo has become one the most reliable sources for quality design around Christmas. Here you’ll find gifts unavailable anywhere else – at least not before well into the next year. , and more. More than 140 Norwegian and international exhibitors are spread out across three floors, which provides a welcome opportunity to engage with the designers and ask about the intentions and ideas behind their products. in Lillehammer during the first weekend of Advent is bound to tune your every sense into early cosy Christmas cheer mode. in Lillehammer during the first weekend of Advent is bound to tune your every sense into early cozy Christmas cheer mode. The museum’s traditional Christmas market features decorated houses ranging from the Middle Ages to the 1950s along with Christmas workshops, gingerbread baking, puppet shows, woodcarving, Christmas card photography, and more than 120 stalls selling a variety of local wares. If you want to experience the good old Christmas feeling, you can visit historical homes decorated for Christmas. Or tag along for the wandering theatrical experience “Silent night – a walk through Norwegian Christmas traditions”, which takes full advantage of the historical surroundings of Norway’s biggest open-air museum. One of Norway’s most popular Christmas fairs is Norsk Folkemuseum’s annual Christmas fair, and understandably so. At the open-air museum in Oslo, visitors can buy Christmas gifts from more than a hundred stalls as they wander through a historical retelling of Christmases both decades and centuries past. The whole museum is decorated in line with various customs and eras, allowing you to experience anything from Christmas Eve in a fancy merchant’s home in 1769 to the home of a rural Norwegian family in 1959.
, Røros is the kind of place where it’s hard not to feel a touch of Christmas the first day the snow settles in the streets. And then the real magic starts. Children with rosy cheeks and locally produced artisan wares like knitted gloves, glassware, cured sausages, smoked salmon, and woodwork line the streets during what could conceivably be named the mother of all Christmas fairs. This is where you go for a horse-drawn sleigh ride underneath a sheepskin blanket, or to have close encounters with real reindeer. For kids, there’s the history walk around town looking for Santa Claus. is refilled every single day from the end of November to 22 December. Every day, twelve new exhibitors will offer a variety of products, from locally produced delicacies and clothes to interior, beauty products, and art. There are also attractions for the kids, amongst them a Ferris wheel and a horse carousel. For that optimal Christmas spirit, visit the impressive Gingerbread town – the world’s largest of its kind. At the Christmas market in Trondheim you’ll come in close contact with farmers and craftspeople eager to tell the stories behind their wares, whether you’re showing interest in a ceramic bowl at the wooden stalls or some exotic jam in the tent that is home to the Farmer’s market. Five large lavvo tents will be built to serve as both café and indoor stage, featuring fireside troubadours, local food, and a theatrical performance for children. And lastly, at the Torvscenen stage, you’ll find a constant stream of talented artists and bands putting on concerts for the benefit of the Salvation Army’s charity work. You’ll get a happy dose of Christmas spirit when visiting the Rådhusplassen square in Haugesund. There you’ll find one of Norway’s largest Christmas fairs with thousands of visitors each year. From the market stalls, you can purchase homemade items such as glass, knitwear, Christmas cakes, cured meats, Christmas ornaments, and other handicrafts. Local bands and choirs contribute to a jolly good start to your Yuletide shopping. There is plenty of fun for kids at the fair, with the traditional Santa Claus parade as one of the highlights. Also, be sure not to miss the gingerbread town at Gamle Slakthuset, which is only a minute away from the Christmas market. 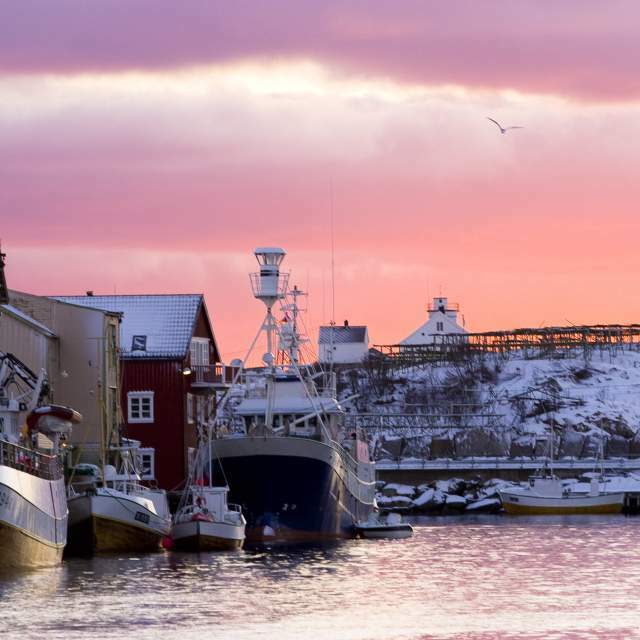 Northern Norway is about much more than the midnight sun – especially as the Christmas spirit is lurking around the corner. And few places in Norway conveys the mood of this holiday like Henningsvær bathed in Northern Lights. With tall mountains and deep fjords as a picturesque frame you can buy local glass crafts and ceramic (or make your own! ), dive into regional delicacies such as the Lofot caviar and paté, or borrow a kicksled for cruising the wintry streets. New this year is the Christmas market in Tromsø’s main street Storgata. Here, two lavvo tents will provide seasonal spirit for eleven December days. Inside the tents, ten exhibitors will showcase lovely food and high-level craft every day. Outside there will be hay bales, campfires and parades, and the arrangers hint that there may be a chance of running into both reindeers and Santa himself at the market. The Christmas Market is a yearly tradition in the town square of Egersund. The different parts of Norway all have their own unique Christmas food traditions. Here are some of the tastiest and most distinctive Norwegian holiday rituals.